Sacred Geometry Atlanta will be filming a multimedia presentation by Randall Carlson, where he will unveil the origins of the numerical patterns upon which our current systems of time and spatial measurement are founded. The key to grasping these cosmic design templates is a canon of sacred numbers that not only reflected the Ancients� understanding of space and time, but also the cyclical nature of cataclysm on Earth. We appreciate any support towards this vital enterprise. Please visit http://sacredgeometryatlanta.ning.com/page/dvd-taping for detailed information and directions. 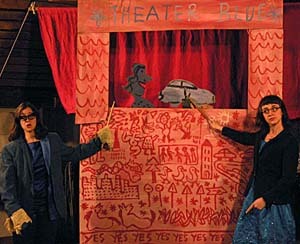 The Bread & Puppet Theater was founded in 1963 by Peter Schumann on New York City�s Lower East Side. Besides rod-puppet and hand-puppet shows for children, the concerns of the first productions were rents, rats, police and other problems of that neighborhood. More complex theater pieces, in which sculpture, music, dance and language were equal partners, followed. The puppets grew bigger and bigger. Annual presentations for Christmas, Easter, Thanksgiving and Memorial Day often included children and adults from the community as participants. Many performances were done in the street. During the Vietnam War, Bread & Puppet staged block-long precessions involving hundreds of people. In 1970 Bread & Puppet moved to Vermont as theater-in-residence at Goddard College, combining puppetry with gardening and bread baking in a serious way, learning to live in the countryside and letting itself be influenced by the experience. In 1974 the Theater moved to a farm in Glover in the Northeast Kingdom of Vermont. The 140-year-old hay barn was transformed into a museum for veteran puppets. Our Domestic Resurrection Circus, a two-day outdoor festival of puppetry shows, was presented annually through 1998. The company makes its income from touring new and old productions on the American continent and abroad and from the sales of Bread & Puppet Press�s posters and publications. The traveling puppet shows range from tightly composed theater pieces presented by members of the company, to extensive outdoor pageants which require the participation of many volunteers. Bread & Puppet is one of the oldest, nonprofit, self-supporting theatrical companies in this country. Just a heads up ... The Mattress Factory studios (near Eyedrum) are having an open studio day/night on May 16th from 12noon to 10pm, so consider going to that as part of your trip to Eyedrum. Artists inside Eyedrum's building are hosting open studio events too. Be prepared for likely severe parking problems. Park over at Nick's across Hill street ... do NOT park in Daddy D'z lot across MLK, they will tow! Abandoned By The Stars, The Subliminator, and The Cross Cultural Dance Company. ABANDONED BY THE STARS is the solo musical project of multi-media artist V. Paganus. In lieu of band mates, V has turned to multi-track recording devices, solo instrumentation and loops of self-made samples to create a sound which could be described as "Melancholy Pop with rare dashes of 'World Beat' teased in here and there." At times Folksy and Post-Punk and sometimes darkly electronic, melodies with lyrics full of pathos and hate abound, having been wrought from years of both firsthand experience and from forays into dreams of the brain at dis-ease. Atlanta's Serson Brannen, veteran spacerocker, started the Subliminator project in '05. After years as a member of Spaceseed he is now a solo act and was immediately sighned to Atlanta's Scared records. "Recalibrated" his first release for the label achieved critical acclaim and another, "Rake" (Quick,what's a rake?) is out now. He has collected two of Creative Loafing's Best of Atlanta awards in '06 and '07. Relentless touring (Who else do you know that tours by motorcycle?) has kept him in the public eye and he has been taking the avant-garde/underground scene by storm. Combining vocals and theremins his sound is unique, original,eclectic, hard edged and brings rock n' roll flash to dark sonic art. aaaaaand "Billy Bud, a portrait in Seamen" by Johnny Drago.